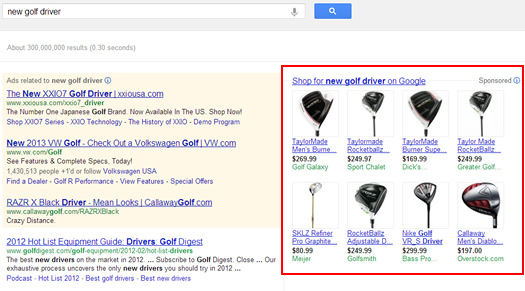 If you’re an ecommerce retailer, then you have probably heard of Product Listing Ads in Google AdWords. Product Listing Ads (PLA’s) are powerful ad units that enable you to display image thumbnails in the search results for products you sell on your site. As you can imagine, the visual nature of the ads yield more ad real estate and can greatly help with click-through rate (since the ads are hard to overlook.) And with the holidays quickly approaching, standing out from your competitors is an important aspect to landing new customers. Interested in a Keurig Coffee Maker? I bet the ads on the right will catch your eye. This past spring, Google announced that Google Product Search was moving to a full commercial model and would be called Google Shopping. 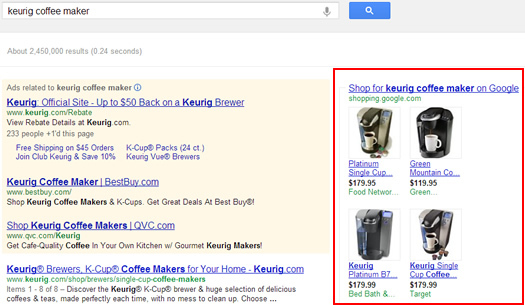 No longer would you be able to have your product ads show up for free (blended in the organic search results). Google originally set a target deadline of October 1st, 2012 for the transition so ecommerce retailers could get familiar with product listings ads (which would be the mechanism for displaying products in the search results). The ads would be cost per click-based (CPC), like PLA’s have always been. This was a big move for Google, as many ecommerce retailers relied on shopping results to gain free clicks to their sites from prospective customers searching for products. Now, in order to have similar results, those ecommerce retailers would need to pay. Therefore, many ecommerce retailers jumped on board the product listing ads bandwagon (as they should). When you run product listing ads, you don’t bid on keywords. 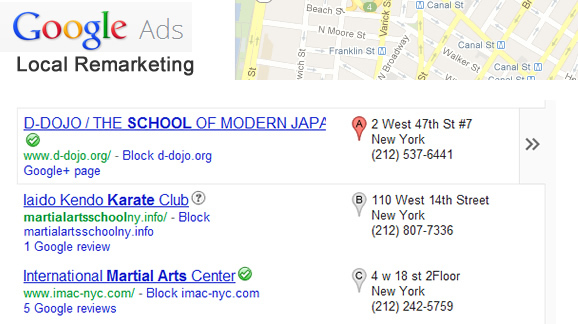 Instead, Google reviews your merchant center feed and then matches your ads with queries that it believes are relevant. In my experience, there are times I see Google displaying product listing ads for queries that aren’t directly tied to the product at hand, or that are more category-driven. This can yield untargeted visitors, higher costs, and lower ROI. And that’s exactly what you don’t want in SEM. Therefore, it’s important to optimize your product listing ads campaigns over time in order to increase performance. Given what I listed above, where do you find the keywords triggering your product listing ads? Unfortunately, they aren’t so easy to find out of the box. In addition, finding the keywords triggering your ads also depends on how you set up and structured your product listing ads campaigns. For example, are you using product targets to segment your merchant feed, are you lumping all products in one ad group, etc? Today, I’m here to help. I’m going to list two ways to find the keywords triggering your product listing ads and I’ll include a bonus custom report at the end of this post that provides even more information for you to analyze. Let’s get started. The first place you can find the keywords triggering your product listing ads is in the AdWords UI (managing your campaign on the web). First, click the campaign holding your product listing ads (which should be a campaign that’s separate from your other search or display network campaigns). Then click the “Keywords” tab. Next, click “Keyword Details”, and finally “All”. This will reveal all the raw search queries that have triggered your product listing ads and that drove traffic to your site (by ad group). Then you can adjust the columns in the report and export the report to Excel. The second way you can find the queries triggering your product listing ads is to access your AdWords reporting in Google Analytics. 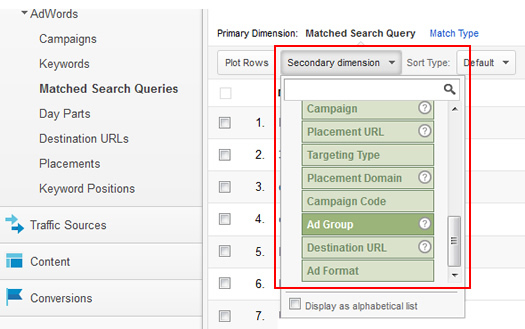 You can click the “AdWords” tab, and then the “Matched Search Queries” link to view all matched search queries for your campaigns. 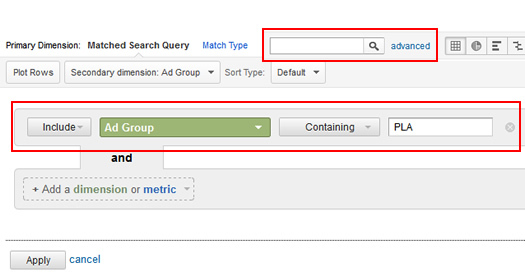 Then, you can add a second dimension for “Ad Group” to view a list of raw search queries by ad group. This is extremely powerful if you segmented your merchant feed using product targets (as mentioned earlier). 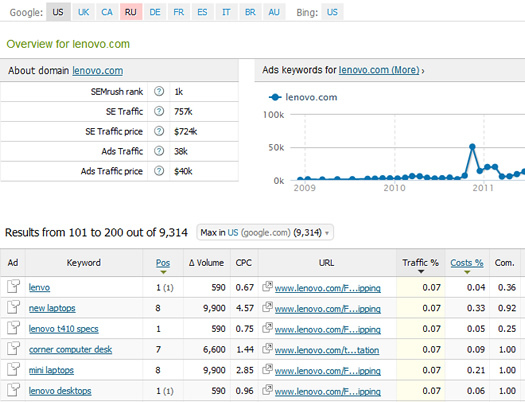 For example, imagine viewing all raw search queries by major brand, product type, etc. 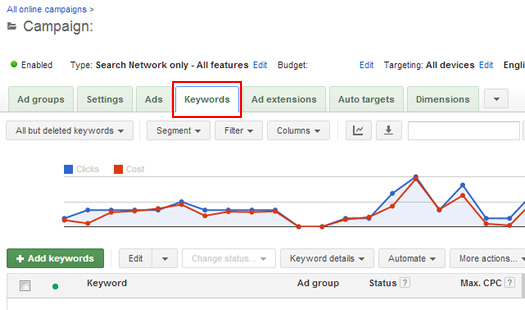 Next, you will need to filter this report based on your naming convention for product listings ads in AdWords. That’s because the report will initially contain all ad groups and matched search queries (and not just queries for your product listing ads). You can use the filter box in your reporting to filter your ad groups to isolate the ad groups for your product listing ads. For example, if your ad groups for product listing ads begin with “PLA”, then you can filter the report to select ad groups that contain “PLA” in the title. When you do this, you will be left with all of your ad groups for product listing ads and the matched search queries that have driven traffic to your site. Then you can export this report to Excel for further analysis. All of what I listed above works well, and can be extremely useful, but there’s a quicker way to drill into this data. You can use custom reporting in Google Analytics to create a new report that enables you to drill into campaign, ad group, raw search query, and then landing page by query. Sounds awesome, right? Well, I’ve built that report and provided a link to it below (so you can use it for your own campaigns). If you are logged into your Google Analytics account, then clicking the link will launch the report in your account (just the structure, not the data). Then you will need to tailor the report structure for your own campaigns. For example, I created the report to isolate a campaign with “PLA” in the name. You’ll need to identify your own product listing ads campaigns based on your own naming convention. Once you do, you’ll be able to drill into your campaign, ad groups within that campaign, matched search queries per ad group, and then the landing page from each query. The report will enable you to quickly identify negatives to use per ad group, and will help you double check landing pages per query. Note, the landing page (destination URL) is based on your merchant center feed, and depending on the retailer, there can be thousands or tens of thousands of products in a feed. It’s always good to double check the destination URL’s to make sure the right queries lead to the right product listing ads, which lead to the right product detail pages. If not, you could be shooting yourself in the foot. Click the link to access the product listing ads custom report I built. 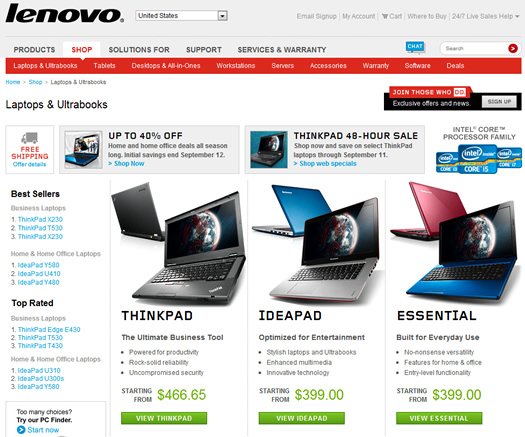 As I mentioned earlier, product listing ads are a powerful ad unit for ecommerce retailers. And now with Google Shopping moving to a full commercial model, it’s critically important for retailers to get a handle on their PLA’s. You can use the methods I provided above to find the search queries triggering your ads and driving prospective customers to your site. In addition, you can use the custom report I provided to drill into your campaigns, ad groups, keywords, and landing pages. Then it’s up to you to analyze your newly-found reporting in order to refine your efforts. And that’s the name of the game in SEM. Have a killer holiday season. 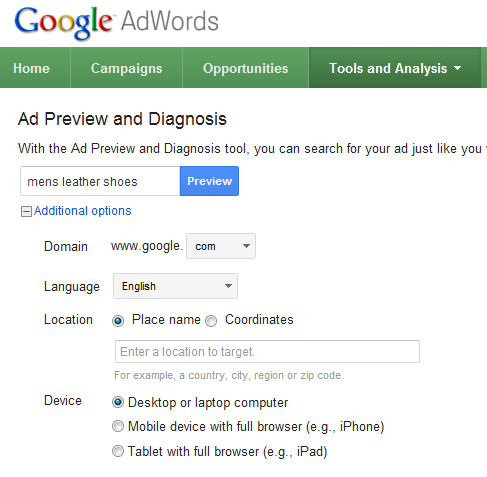 Google AdWords rolled out a new feature last week that will make the lives of some SEM’s easier. 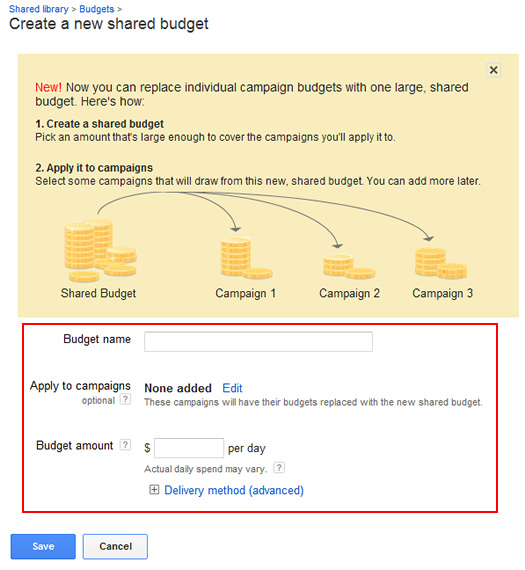 The new shared budget option enables marketers to apply one budget to multiple campaigns (versus having to manage budgets for each campaign separately). 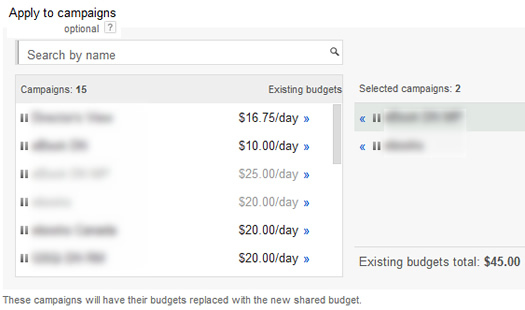 Shared budgets make it easier to maximize your total ad spend for paid search since you can let the AdWords system allocate budget across selected campaigns without having to specify a specific budget for each. For example, a typical AdWords account has several campaigns set up, all targeting different audiences. You might have search campaigns, display network campaigns, remarketing campaigns, mobile campaigns, etc. In the past, you had to allocate budget for each. If you had $250 per day to spend, you would have to divvy up the budget across those campaigns. But, if you allocated $100 to your core search campaign and it only hit $60 on some days, then the additional $40/day was not used. Over time, that can lead to a lot of lost clicks, conversions, and revenue. Using this new feature, you can ensure that your budget doesn’t sit on the sidelines when it can be working for you across other campaigns in your account. Shared budgets work well for companies that want to make sure their allocated budget is used each day across campaigns (no matter which selected campaigns use that budget). For example, if a company has refined its campaigns over time based on performance, then using sharing budgets should help them achieve stronger results. i.e. ROI is strong across campaigns, so feeding those campaigns more budget is a good thing. If you don’t have a solid understanding of your ROI, then shared budgets can drive more wasted budget. Be careful if you are just starting out and need to keep a close eye on budgets. If you are in this situation, I recommend setting specific budgets per campaign and working on refining those campaigns based on performance. Then when you get your campaigns to a stage where performance is strong, then a shared budget could work well for you. I guess what I’m trying to say is that you shouldn’t just pull the trigger on a shared budget. You need to first set up, manage, refine, and optimize your campaigns before you do. That’s the only way to know that the additional money you spend will yield conversions. Setting up shared budgets is relatively straight forward. Below, I’ll cover the steps you must take to share a budget across your AdWords campaigns. 2. Click “Shared Library” in the left-side navigation. 3. Click “Budgets” in the left-navigation. 4. Click “New Budget”, name your new budget, select campaigns to apply the budget to, and set a dollar amount for the budget. 4a. 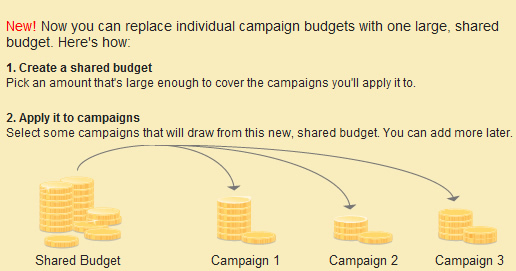 Note, you can choose specific campaigns to apply your shared budget to in the previous step. The shared budget doesn’t need to be applied to the entire account. 5. Click “Save” and your new shared budget will be added to your shared library. You’re done! 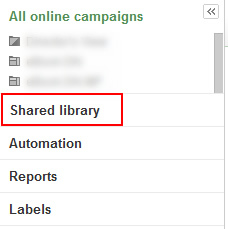 You can check your campaigns in the AdWords UI to ensure the shared budget is being used for your selected campaigns. Although this is a great move by AdWords, I hope they expand the shared budget functionality even more. For example, it would be great to give a priority to certain campaigns within a shared budget. For example, if you wanted to share a budget across campaigns A, B, and C, but B is the most important of the three, then it would be great to let AdWords know that. Then the system could prioritize budget during the day, based on that signal. Also, maybe AdWords could provide a minimum threshold value per campaign within a shared budget. This would be another signal you could provide Google to make sure certain campaigns are given priority. For example, maybe you could tell Google AdWords to make sure Campaign B should be allocated a minimum of $100/day (if demand is there). I do a lot of work with Google Grants, which is an incredible program from Google for non-profits. Google Grants provide $10K in free AdWords advertising for approved non-profits. I covered the program extensively in a post about maximizing a Google Grant account. If you read my post, you’ll learn that there are some serious limitations with Google Grants that many marketers can’t easily overcome. One of those barriers is trying to drive visits with only a $1.00 max cpc. Based on the limited max cpc, I find many non-profits find it hard to drive a lot of traffic from target keywords via their Grants accounts. So, as non-profits set up several campaigns, it’s hard to allocate pieces of your $329/day daily budget limit. When auditing Grant accounts, I often find some campaigns not even coming close to hitting their daily budgets, while other campaigns could utilize that extra budget. This can severely impact the traffic levels being driven by Grant accounts. Well, shared budgets are a great solution for Google Grant owners. You can set the $329/day shared budget and share it across all of your search campaigns. Then you don’t need to worry about trying to allocate budget across your campaigns (like I explained above). AdWords will make sure that if demand is there, your campaigns will be fed the appropriate budget. As you can see, the new shared budget functionality can be extremely helpful for certain accounts. I recommend analyzing your campaigns to see if a shared budget is a good fit for your company. If it is, you can use the steps I listed above to set one up today. If your campaigns are performing well, then using a shared budget can drive more visits, conversions, and profit. And that’s exactly what SEM is all about. Good luck. There are a lot of moving parts to developing and managing SEM campaigns. First, you need to develop a strong paid search strategy, perform keyword research, map out a robust structure for your campaigns and ad groups, determine budgets, create effective ads, etc. After the setup phase, you will be neck deep in ongoing campaign management, which involves refining your campaigns and ad groups based on performance. That includes refining keywords, ads, creating new ad groups when necessary, pausing ad groups or campaigns that don’t perform well, split testing ads, etc. This includes managing both Search and Display Network campaigns. As you can guess, SEM is definitely not for the faint of heart. Based on all that’s involved with paid search, I think it’s easy for SEM’s to keep driving campaigns forward without taking a step back to analyze the competitive landscape. For example, which companies are you competing against in SEM, which ads are they running, what types of landing pages are they using, how does their pricing stack up, etc. That’s where a thorough competitive analysis can pay huge dividends. There are so many important things you can learn from analyzing the competition that I’m surprised more companies aren’t doing it. In this post, I’m going to explore five important insights you can learn from performing an SEM competitive analysis. My hope is that once you read through this post, you’ll be eager to get started on your own analysis. Let’s get started. What’s an SEM Competitive Analysis? Simply put, an SEM competitive analysis enables you to understand the companies also bidding on the same keywords and categories you are targeting in paid search. Let’s face it, if you are bidding on a set of keywords, it’s important to understand which competitors are targeting the same keywords, where they are driving visitors, how aggressively they are bidding, the pricing they are providing for similar products, etc. While performing the analysis, there are times you find incredible nuggets of information that can help enhance your own campaigns. You can also understand why certain competitors might be outperforming your own efforts. This post isn’t meant to provide a tutorial on how to use the various competitive tools in the industry. There are many to choose from and you should test them out to determine which ones fit your needs. Pricing-wise, some are paid solutions while others are offered for free. For example, SEMRush and SpyFu are two paid solutions that enable you to view a wealth of competitive SEM data such as keywords, ads, cpc’s, volume of traffic, etc. Google’s Ad Preview Tool is free and enables you to view an unpersonalized SERP, while also enabling you to specify geographic location, mobile vs. desktop, language, etc. In addition, AdWords recently released Auction Insights, which gives you a view of the companies you are competing with on a keyword level (if there is enough data). You can view a competitor’s impression share, their avg position, the overlap rate, the percentage of times they rank above your own ads, etc. Again, there are many tools on the market, and my recommendation is to figure out the right combination for your needs. Many of the paid solutions have free trials, so you can start using them immediately to gauge their effectiveness. Whenever I begin helping a new client, I always ask them who their top competitors are. It’s a trick question, since the standard set of competitors in the industry might not be the same competitors in SEM (or SEO). Understanding which companies are present in the SERPs for target keywords is extremely important. For consumers that don’t know which company to do business with, and start searching Google, the offline competition might not make a big difference. That’s why you need to understand your true competitors in SEM. That’s who prospective customers will be reviewing while researching online. When I present my findings with regard to true competition, it’s not uncommon for my clients to fall out of their chairs. Sure, they might find some familiar faces, but they might find some additional companies or websites that surprise them. For example, say hello to Amazon.com, the biggest and baddest ecommerce retailer on the web. If you are selling online, Amazon very well could be a core competitor in SEM. If that’s the case, you better check out pricing on Amazon.com, how often they show up for your target keywords, which third party sellers are providing similar products, etc. Let’s face it, low pricing and Amazon Prime membership is a killer combination that you’ll have to face and deal with at some point. And you’re not alone. You also might find comparison shopping sites, forums, answer-driven sites like Yahoo Answers, personal blogs, etc. If you do, you might need to form a strategy for monitoring those sites to ensure you are represented (the right ways). You might find manufacturer websites that provide links to online retailers that offer their products. Are you listed there? Should you be? I think you get the picture. Understand the real competition, dig deeper, and form a strategy for dealing with those “competitors”. OK, so now you know which companies you are competing with in SEM. Your next question might focus on which keywords they are running. This is important for several reasons. First, you want to make sure you aren’t missing important keywords or categories that customers are searching for. Even if you performed keyword research, you might have missed something. 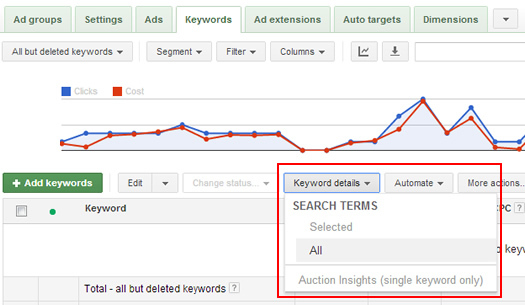 Analyzing keywords your competitors are running could help close the gaps. Second, you can start to gauge how much traffic each keyword or keyword category is driving to your competitors’ websites. For example, if you see a larger percentage of traffic for certain categories, there might a good reason for that. Maybe they are seeing outstanding performance from those keywords or categories, and they are allocating more budget to those keywords. Note: there are many companies not managing SEM correctly, so be careful here… If you see something stand out while analyzing the keywords that competitors are running, you can and should, test those yourself. As long as you have a strong analytics strategy in place, you can easily identify high quality traffic, strong performance, etc. 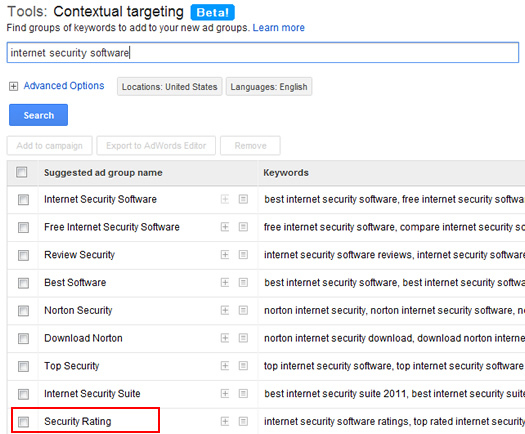 I guess what I’m saying is that keyword intelligence is great to attain, but nothing compares to actual testing. Next on our list are the landing pages that competitors are using. Let’s say you were running an ad group for an important category. You are getting a lot of traffic, but not many conversions. You’re baffled why that is… Well, analyzing the landing pages that competitors are using can tell you a lot. Are they driving visitors to product detail pages, campaign landing pages, lead generation pages focused on gaining contact information, mobile landing pages (for mobile traffic), etc? All of this can help you better understand why your competitors might be outperforming you in SEM. Understanding the landing page experience for prospective customers can help you form ideas for your own landing pages. If you are driving visitors to a product detail page and competitors have set up dedicated campaign landing pages with a wealth of information, images, video, reviews, live chat, etc., you might want to refine your efforts. Don’t pale in comparison to your competition. It could be the very reason you are seeing less conversion (or no conversion). 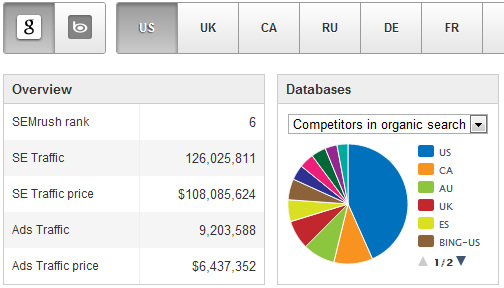 Using competitive tools, you can review the text ads that competitors are running. When prospective customers are facing a SERP filled with paid ads, it’s important to stand out (for the right reasons). Are your competitors punching sales, deals, special offers, etc? Are they providing actual pricing in their ads? Are competitor text ads aligned with the landing pages they are driving visitors to? All of this can help you understand why your own performance isn’t as strong as it should be. And let’s not forget about ad extensions and product listing ads. Are your competitors using sitelinks extensions, product extensions, call extensions, local extensions, social extensions, etc? The extra information provided by ad extensions can be extremely valuable to prospective customers. For example, you can drive visitors deeper to certain sections of your site, to specific products pages, show social connections, click to call phone numbers, etc. And if you’re an ecommerce retailer, don’t overlook the power of seller rating extensions. Those little stars can bring a level of credibility that can mean the difference between revenue or just a click. In addition to what I mentioned above, I have to cover the power of product listing ads. Recently, Google transitioned Google Shopping to a pure paid model. 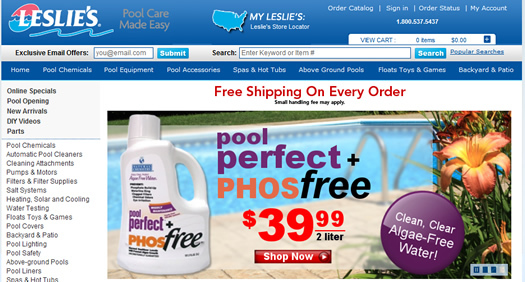 Product listing ads are an important part of that model, and are extremely powerful. They are image-based ads for specific products, based on your merchant center feed. They are CPC-based and can help drive strong performance for ecommerce retailers. If your competitors are running PLA’s, and you aren’t, you better get in the game. 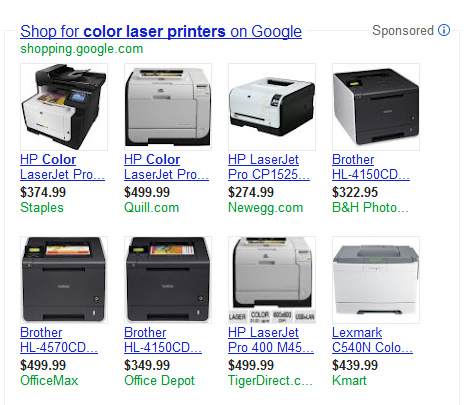 There are times text ads just don’t compare to the image-based PLA’s competing for attention in the SERPs. The final insight I’m going to cover is probably the most important – pricing. Performing a competitive analysis will reveal the pricing your competition is providing for the same products you are selling. The power of the internet is a double edged sword for many sellers. You can now compete with the big boys, but you will also be compared with every other seller on the web. And this can happen in mere seconds as people research products via Google, Bing, and Yahoo. I find this step in a competitive analysis provides incredibly important insights for my clients. They are sometimes floored by what they are seeing. Actually, it’s not unusual for some clients to start yelling as I’m presenting my findings. “How are they providing that pricing?” “That can’t be right.” “They are lowballing prospective customers!” I’ve heard every possible comment under the sun. Regardless, unless a consumer knows and trusts your company, you are going to have a hard time comparing to a competitor selling the same product at 20% lower than your own pricing. Not every person will go with the lowest price (based on a number of credibility factors), but some will. And when you are paying for every click, it’s important to keep those visitors on your site with the hope of converting them. Are you ready to get rolling with your own competitive analysis? As I covered above, there’s a lot you can learn. It’s important that you don’t get so caught up in your own campaigns that you forget to learn what your competition is running, how much they are spending, where they are driving visitors, and what type of landing pages they are using. You never know, you might end up finding serious gaps in your own campaigns. And that can lead to more revenue, profit, and a stronger ROI. Good luck. Have you ever visited a website, researched a product or service, and then left only to see that company’s ads as you browse the web? I bet you have. That’s remarketing in action, and it’s darn powerful when implemented correctly. Sure, there can definitely be a creepy factor, since users are being followed around the web, but getting your messaging back in front of people that already visited your site is a very smart move. Using remarketing in AdWords, you can tag specific visitors to a certain page, or section of pages, and then remarket to them as they browse the Google Display Network (GDN). The GDN includes any site running Google Ads, and includes Google properties like Gmail, Google Maps, YouTube, etc. It reaches approximately 80% of all web users. It’s also important to note that you can use both image ads and text ads across the Google Display Network. This gives you more creative options than just text ads like in Search. When you think about remarketing campaigns, it makes complete sense to think about ecommerce retailers. Prospective customers visit category or product pages, and left without converting. Maybe they even added items to their shopping cart, but left without completing a purchase. It’s smart to get targeted messages back in front of those people, like special deals, offers, etc. So it makes sense for ecommerce retailers, but what about other types of businesses? Can they also utilize remarketing to increase sales? You bet they can, and I’m going to tackle remarketing for local businesses in this post. As consumers research local businesses, they might visit several different websites during their research. Tagging visitors that hit your own site, and then getting your message back in front of those prospective customers, can be the difference between just another visit and a paying customer. And when local is heavily influenced by word of mouth, that one new customer can actually turn into 5, or more. For certain types of local businesses, consumers will inherently act fast. For example, if there is an immediate problem someone is having with their home, then you might only have a few days to land that customer. Then there are other local businesses that aren’t as time-sensitive, and you’ll have much longer of an opportunity to get back in front of them. For example, a plumber or electrician might only have a few days, while a karate school or day care center might have longer. In order to tackle timing issues, you can adjust the membership duration of your remarketing list to shorter or longer during the setup phase. The membership duration tells AdWords how long someone should remain on your remarketing list after being tagged on your site. For example, you might set a membership duration of just 10 days for the plumber example I mentioned earlier, but 90 days for a daycare center. Now that we’ve covered timing, let’s talk about local remarketing strategies. Again, we have the ability to tag certain visitors (or all visitors), and then provide targeted ads in front of that audience as they browse the web. It’s important that you analyze the various types of visitors hitting your site, understand the campaigns you are currently running, etc. before implementing a remarketing campaign for local. Those considerations can absolutely help you tailor your efforts, and drive higher performance. Below, I’ve listed several ways that local business can implement remarketing campaigns. Note, this does not include every possible way to implement remarketing, but can definitely get you moving in the right direction. Let’s begin. This is obviously the broadest strategy, but can still work. This involves tagging every visitor to your local site, and the remarketing to them as they browse the Google Display Network. It’s definitely smart to get back in front of people that were interested in your business, but the messaging won’t be as targeted as the other approaches I’ll list below (since you didn’t isolate pages or sections). If you are new to remarketing, then this is a good way to start. With regard to your ad creative, you can punch your current deals, packages, etc. And just to clarify, your remarketing ads will only be shown to your remarketing list, which includes people that already visited your site. Definitely make sure to include a strong call to action, which applies to all strategies I’m including in this post. For example, ask them to act. For many local businesses, the contact page is an extremely important page on their websites. 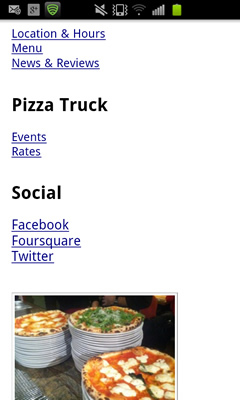 Since they are local, visitors will often check out the contact page to find the address, phone number, directions, etc. I’ve helped some local businesses build remarketing campaigns using this page as the trigger, and it can work well. By tagging this page, you can provide targeted messaging to visitors that you know visited your contact page. For local businesses, this is the equivalent of someone adding an item to their shopping cart on an ecommerce site. Theoretically, they are more targeted than the average visitor, so you definitely want to get back in front of them. You might be more aggressive with your messaging and calls to action. Maybe you’ll provide an incentive in your ads to get members of that audience to convert. Note, you can test various ads to see which ones perform best. This can help you better understand the messaging that works best for the audience (people that already visited your contact page). 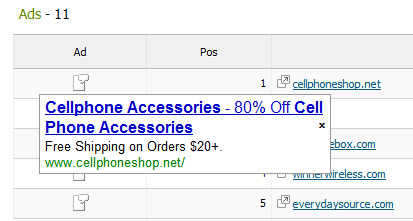 Also, since you can use image ads across the Google Display Network, you can test visuals, as well as just text ads. If you have a contact form on your website, make sure you use a custom combination (mentioned earlier) to exclude those visitors from your remarketing list. Since they already “converted”, they shouldn’t be on your remarketing list. That’s unless there’s some other type of messaging you want to provide to that audience. For example, you might choose to drive return customers by providing special messaging and incentives to them as they browse the web. This is why it’s important to map out a solid remarketing strategy before pulling the trigger. Many local businesses provide deals and special offers. 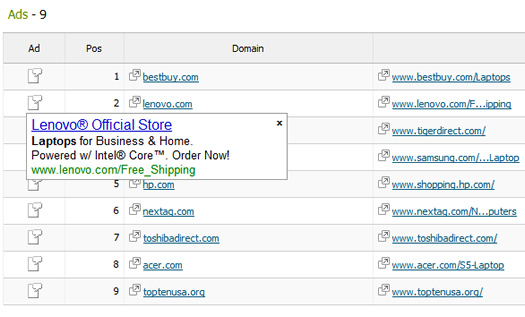 If you provide these deals on specific pages, you can tag those visitors by deal or sale. 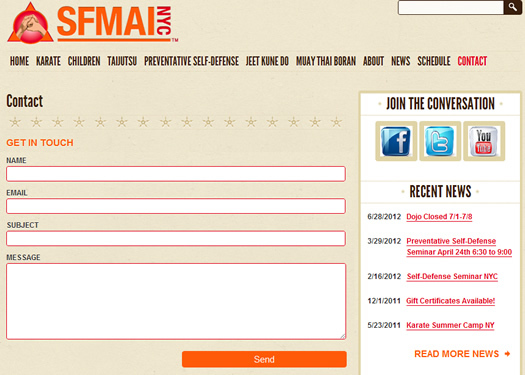 Then you can remarket to them with messaging specific to the page they visited. You know they are interested in your company, and you know they were interested in your deal or offer, and you can use that combination to craft targeted ads to get them back to your website. For example, maybe you are providing a package deal where customers can get 30% off your cleaning service if they buy a package of four cleanings. If you know someone visited that special offer page, you can provide ads punching the offer to that specific audience as they browse the Display Network. And again, you can use both image and text ads. Similar to what I listed above, you can remarket to people that visited one of your sale pages. For example, having a Labor Day Sale where you are providing 20% off everything in your store? If prospective customers have visited that sale page, you can tag them and then remarket to them as they browse the web. This can be extremely important, since many people will research products before pulling the trigger. Let’s say they left your site, and visited YouTube to view video reviews of the products you sell. 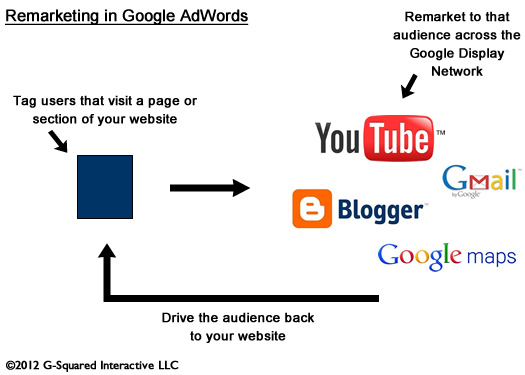 Using remarketing, you can provide ads to this audience as they view videos on YouTube. Again, this is a smart way to use remarketing, since your ads can punch your 20% off store-wide sale. Since you are a local businesses, you can mention your location, a strong call to action, and possibly even an additional incentive to get them to the store. The sky’s the limit with what you can do. With mobile booming, many businesses are starting to provide a user experience tailored for mobile visitors. For example, you can redirect visitors to a mobile version of your site, you can format your content on the fly for mobile devices, etc. For local businesses, this can be extremely important since prospective customers might be on the go, quickly looking for phone numbers, directions, store hours, etc. You can also provide mobile-formatted campaign landing pages for specific sales. You can absolutely tag mobile visitors just like desktop visitors. Since they visited your mobile pages, you have some additional intelligence about them. You know there’s a good chance they were on the go, that they probably didn’t view all of your product pages, that they might not have been able to research all of the specifics of each product, and they might not have viewed your videos. Again, you know what your mobile pages provide, so you know what this audience could have missed. 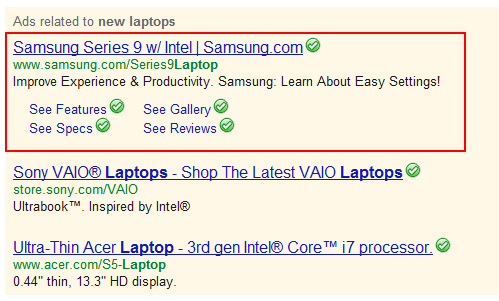 Using remarketing, you can make sure you get your ads back in front of these people (on their desktop systems). Targeted ads can include copy and visuals that punch the desktop functionality and content. You might include messaging about your product videos, high resolution photos of products, customer reviews, etc. Make sure they know they can find all of that rich content by revisiting your site. And since everything is trackable, you can understand the impact of reaching this audience via remarketing. Many local businesses would love to get their ads in front of people that call them directly, but that’s hard to achieve. Here’s a workaround. As they call, make sure you get their email address. You can then send a follow up email thanking them for calling, and providing a special offer that they can access via a specific URL. You can then tag those visitors as they view the special offer page. Note, this page should be isolated from your other pages, since you want to make sure only prospective customers that call will be on the remarketing list. If you do, then you can tailor specific ads for people that called, with the goal of turning them into paying customers. In closing, there’s a reason why remarketing has taken off. It works. Now it’s your time to leverage remarketing to drive more local customers. Go ahead, set up your first campaign now. Keyword research is a critical component to a solid and rounded SEO strategy. When you break it down, you need to know what people are searching for in order to target the right terms. Keyword research fuels your content generation strategy. I use a wide range of tools when conducting keyword research and each has its own purpose. In the past, one of my favorite free tools was Google’s Wonder Wheel. You’ll notice the word “was” in the last sentence. That’s because Google shut down the tool last year, while many search engine marketers screamed a collective “NO! !” while it was happening. Many people in the industry used Wonder Wheel to visually find related keywords, which often helped expand your keyword research (down the right path based on data). Wonder Wheel’s related terms were based on Google data (same session searches), so you knew the terms being displayed made sense. Also, the visual nature of wonder wheel made it very interactive and easy to use, while returning a smart path for search engine marketers performing keyword research. As you clicked a word, related terms appeared around that term. As you clicked related terms, it became the anchor word, with more terms appearing around it. So on and so forth. 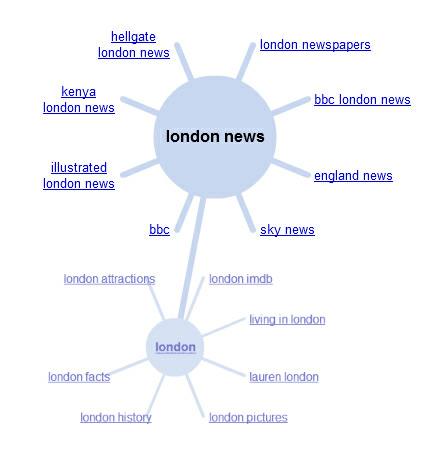 It was a phenomenal way to find related keywords in an interactive and visual way. Needless to say, we all missed the Wonder Wheel. I had the opportunity to attend the Google Agency Summit last week in New York City at Google Headquarters. It was a great day packed with presentations covering the latest in Mobile, Video, Analytics, Social, etc. One of the first presentations was by Jordan Rost covering some of the free research tools that Google provides for marketers. As Jordan was covering Google Correlate, I asked if it could be used in a similar way to the old Google Wonder Wheel. He shot me a quick look and said, “Not exactly, but I’m getting to the Wonder Wheel soon.” Needless to say, I was excited to learn more! 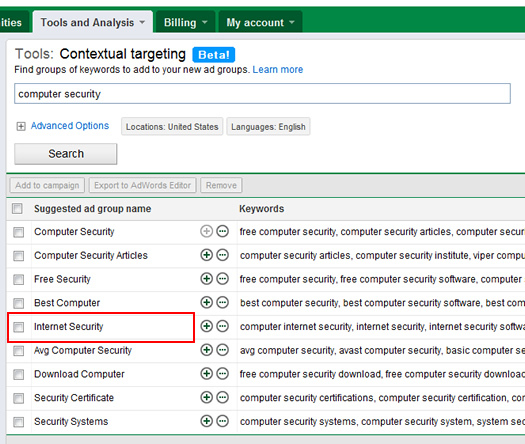 I do a lot of paid search work, so I’m extremely familiar with the Contextual Targeting Tool (CTT). 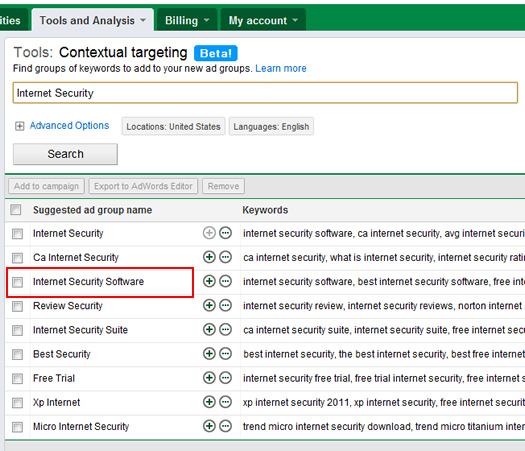 But it seems the CTT contains a surprise that many search marketers don’t know about. Sure, it was often listed as an alternative to Wonder Wheel, but was it a solid replacement? Does it provide the same great same session data we were getting from Wonder Wheel? Well, Jordan explained that the Contextual Targeting Tool is run by the same engine that fueled Wonder Wheel. Note, I’m not referring to a similar type of engine. It’s the exact engine that ran the Wonder Wheel! That’s awesome news, and it was great to receive confirmation of this. Sure, it’s not as visual as Wonder Wheel, but it can still yield the same results. So, I’m going to walk you through a quick example of finding related terms by using the Contextual Targeting Tool below. Again, the purpose of Wonder Wheel was to find related terms, based on actual Google data. Let’s dig in. Let’s say you focused on computer security and you were just beginning keyword research. You know several keywords and categories you want to target, but want to find related terms, based on Google’s wealth of data. That’s a smart move, since you don’t want to leave keywords (and targeted traffic) on the table. Let’s head over to the Contextual Targeting Tool to do some research. 1. 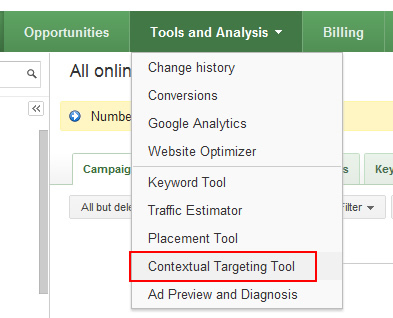 Log into AdWords, click the Tools and Analysis tab, and then select Contextual Targeting Tool. Note, the primary purpose of the tool is to help search engine marketers build tight themes of keywords for Display Network campaigns. But, we’re going to use it as a replacement for the Wonder Wheel in this example. 2. In the text field at the top of the page, enter “computer security” without quotes. The CTT will display several rows of data containing related keywords, based on the initial keyword you entered. 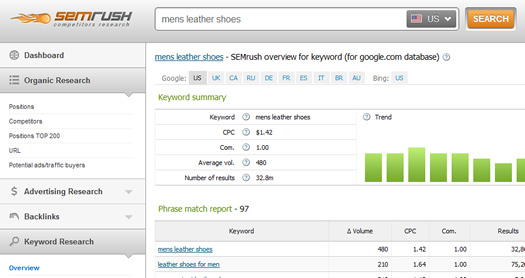 You will see the anchor keyword on the left and then five related keywords in each row. This is where you can start to gain great ideas for related terms. 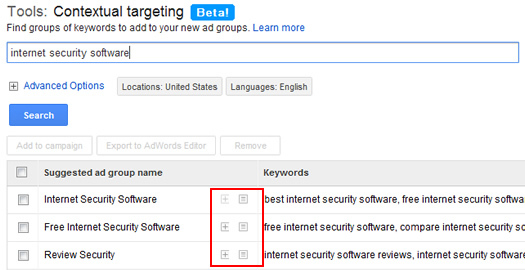 Again, these keyword grouping are being driven by the Wonder Wheel engine. 2. In our example, I see “internet security”. Maybe I didn’t know people were searching for that keyword, in addition to “computer security”, and I want to use that term as our keyword anchor (to find more related searches). When I enter that term in the text field, I now get more rows of data, based on that new keyword. 4. You can also click the plus sign (+) to expand a certain category, which will reveal additional rows with related keywords. You can see how this can become both valuable and addictive. :) Sure, this isn’t as visual as Wonder Wheel, and it takes a few extra steps, but the data is the same. To me, running through this exercise is an essential component to performing thorough keyword research. Let’s face it, you won’t know every keyword that people are searching for. Actually, many people are too close to their own industries, products, and services to know how the average person is searching. Using Wonder Wheel, I mean the Contextual Targeting Tool, you can find some gems that you might never uncover normally. That’s why I love this functionality. Summary – Long Live Wonder Wheel!